The EasyPass feature in Trakdesk is a pay as you go service that works hand-in-hand with part time / temporary agent accounts. The EasyPass feature is literally built to save you money. A great scenario would be; Let's say you have an employee in your company that works part time and only logs into the helpdesk two (2) days per week, rather than paying for a full time agent account, you can convert the agent to a part time account so you will only get charged for the days the agent actually logs into the helpdesk. Full time vs Part time agents. Part time agent starts from as low as $1.49 per day, based on the plan you are subscribed to. If a part time agent logs into the helpdesk 2 days per week and the cost per day is $1.49, then you would pay: 2 x 1.49 x 4 = $11.92 per month. Additionally, usage is calculated by 24 hours interval, not actual calendar days. For example; If a part time agent logs into the helpdesk on Monday at 2:30 PM, you will only get charged again if the agent logs into the helpdesk on Tuesday at 2:31 PM or later. 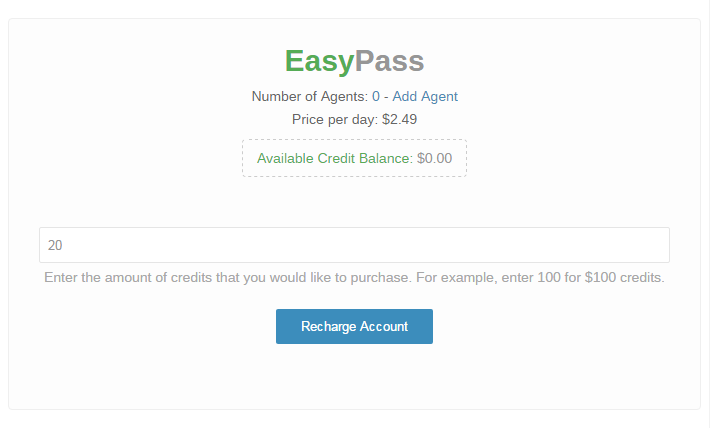 Enter the amount of EasyPass credits you would like to purchase. Note: The minimum transaction amount is $20 USD. Finally, click on the Recharge Account button to process the payment and recharge your account. Note: If you have insufficient credit balance, Part time agents won't be able to login to the helpdesk until you have recharged your account.